A cameraman from New Hampshire Chronicle films Liz Barbour’s June 29 presentation at the Amherst Town Library. 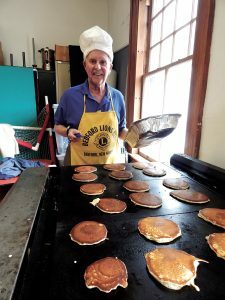 The 19th century essayist probably never had to cook a meal for a family, but Liz Barbour says he was on the right track. 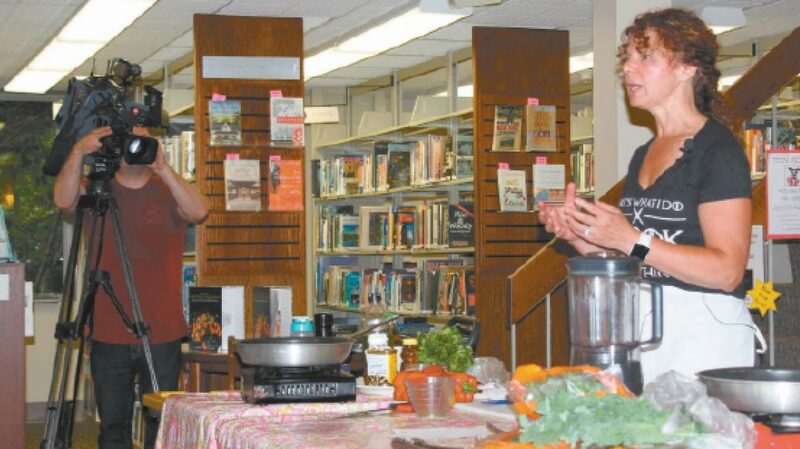 “We have so many things in our kitchens,” the cooking instructor told a crowd at the Amherst Town Library recently as she offered numerous tips for simplifying cooking and menu planning. During colonial times, she said, if you had a table you were lucky. If you had one cast iron pot, you were well-to-do, and you kept the pot on the stove and added ingredients when you had them. With no attic or cellar she felt cheated, but the lack of storage space became a blessing when she set to work simplifying and organizing. She identified key pieces of equipment and put them where they are handy, while stowing away, or getting rid of, items used less often. “Do you need all this?” she said, showing a slide of dozens of pots and pans stuffed into a cupboard. For those who think they are too busy to organize, “do it in baby steps,” she said. What most impressed the audience was the picture of a drawer full of neatly arranged plastic food storage bowls and lids. “Aren’t you jealous?” she teased. “Imagine how rested and relaxed I am” when it’s time to clean up. Barbour provided lists of essential food preparation equipment, with a good quality 8-inch chef’s knife at the top of the list, as well as baking equipment and tips on organizing a kitchen for maximum efficiency. Throw away or give away everything that doesn’t fit into a healthy menu plan, she advised, and make sure labels face forward, put date labels on frozen foods, and go through the freezer monthly. To simplify menu planning, make a list of favorite easy recipes and take the list of ingredients to the grocery store. Practice creative leftover use: a chicken breast cooked on Monday is easily made into burritos on Wednesday and pasta sauce on Friday. No chicken? Slice a hard-boiled egg into pasta sauce for protein. Using portable gas burners, Barbour made two dishes from her new cookbook: a veggie rice bowl with curry miso dressing and minted spring peas and radishes. She explained the techniques step by step, and the audience stood in line for samples when she was finished and took home copies of two recipes from her book, “Beautifully Delicious,” which was inspired by her edible flower garden in Hollis. Barbour has given more than a dozen presentations at the Amherst library, and she drew a large crowd. She has also appeared on WMUR’s “Cook’s Corner” and in New Hampshire Magazine. During the June 29 presentation she was filmed for New Hampshire Chronicle, with the broadcast scheduled to air around the end of July. The evening event was the second of the library’s summer reading program for adults. The next one is on Wednesday July 19, at 7 p.m. Steve Hale will talk about red-line hiking in the White Mountains. Red-lining is hiking every mile of trail on the map (denoted often in red lines) of some large area, in this case the White Mountains of New Hampshire and Maine.